On the 16th of October, I supported the Kyoto Reception at the Sakurai after the wedding ceremony in the Kamigamo Shrine. We were worried by the weather forecast, however we were blessed with a blue sky and with an apparition of a rainbow. 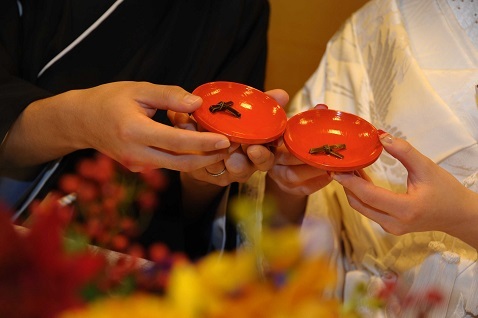 The banquet began with a toast with “the seaweed drink”, in order to satisfy the bride and the groom who like tea. Wonderful dress (handmade) and tuxedo. The dress was designed and made by the grandmother withthe obi wore during the wedding ceremony. One can feel how it is an important inheritage for the bride. Thank you for having been able to support a warm and really wonderful wedding ceremony.